Your 5500 square foot luxurious accommodations in the exclusive Penthouse at Ocho Cascadas is the ultimate in romantic luxury in Mexico. 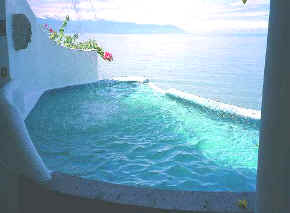 Your own private pool, spa, maids, cook, houseman, gardener, gives you the ultimate Mexico vacation Paradise. 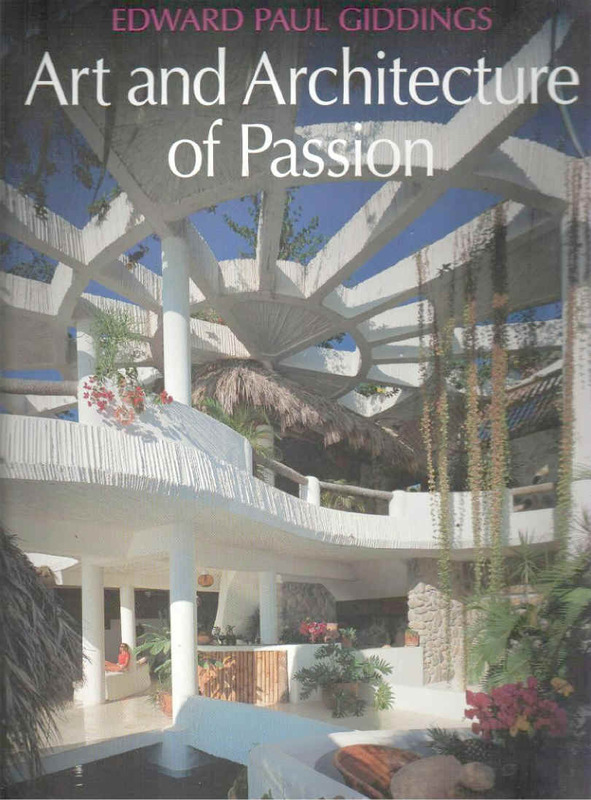 Whether you are planning a honeymoon, romantic getaway, or or just want to bath in Mexican vacation luxury, the Penthouse at Ocho Cascadas in Puerto Vallarta Mexico will thrill, inspire, and bless you with unparalleled luxury and everlasting memories. 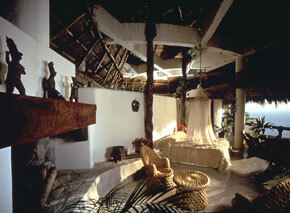 The room on the right is our ultimate romantic honeymoon Master Bedroom with indoor and outdoor/screened showers. The ceiling is about 20' above the bed. Magnificent views from everywhere within and from the bedroom veranda. 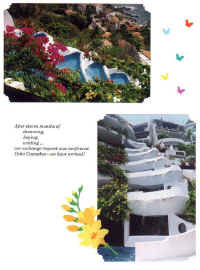 In the photo on the right you are looking across the sofa across part of the exclusive private pool across the bar and hot tub over some flowers to a beautiful view as far as you can see. The stairway on the left leads up to two private master bedrooms. The exclusive kitchen with a cook and house boy waiter is far down to the left. 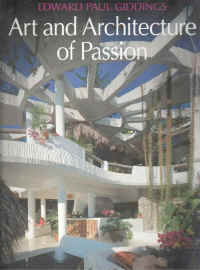 There is over exclusive 5500 square feet of luxury living space. 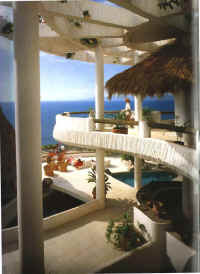 If you need more space we have another luxury villa attached below the Penthouse. On the left is a picture of part of the exclusive private pool in our luxurious villa below, a spectacular honeymoon villa by itself. The ultimate romantic vacation. 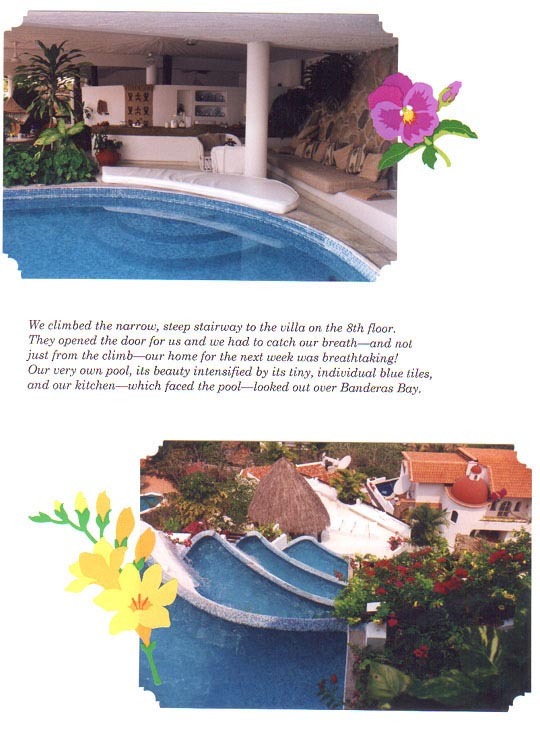 The picture on the right is also the romantic villa below us that we have available the same week as we have our Penthouse. 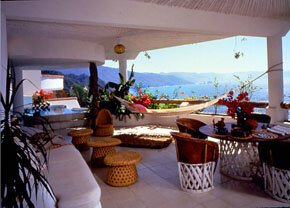 Rent this villa for a honeymoon, romantic getaway, or additional guests. We are staying home for the birth of our third grandbaby. I plan to add to this web page soon and fill in all the blanks. 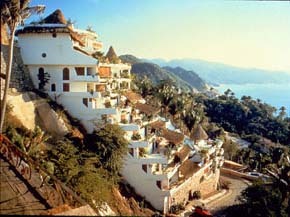 Spectacular Exclusive Villas at Ocho Cascadas in Puerto Vallarta, Mexico. I'm leaving some of my miscellaneous web page parts attached below to help you understand how I may be finishing this site. If you have always dreamed of an ultimate Mexican vacation at reasonable prices I suggest very very very strongly that you pick this opportunity. We will help you plan your vacation. 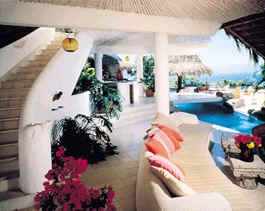 We have 20+ years experience in Puerto Vallarta, Mexico and we love doing it all. We pay over $3000 every year for our maintenance on these weeks in June. These are the private home pages I found while building this page. 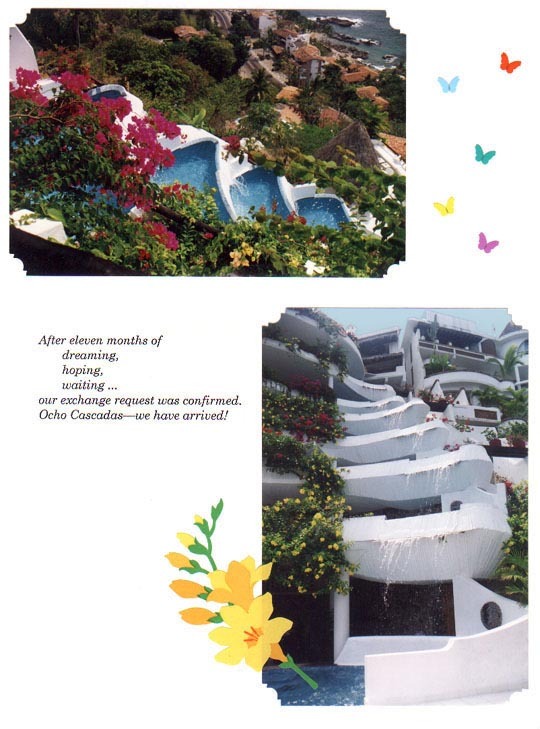 Click on each of these thumbnails and you can see how people have waited for many years for a chance to vacation at Ocho Cascadas. This person must have been able to stay at one of the villas below the penthouse. Our children still vacation with us after twenty years and still like Ocho better than any other place they have been or have ever heard of. The Top Ten Worldwide Resort Award list below was copied from a page of the Timeshare Users Group. 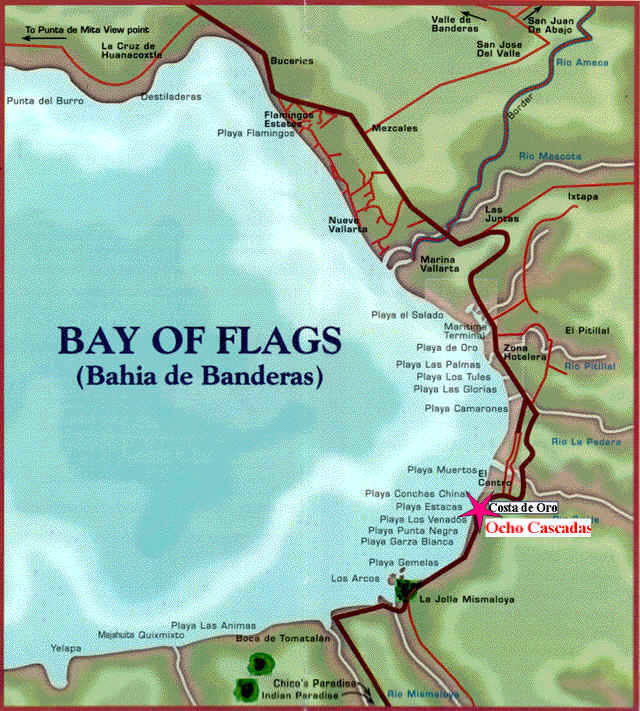 Pretty amazing that Ocho Cascadas in Puerto Vallarta Mexico is just a tiny 10 villa resort and all the others are zillion villa resorts backed by zillion dollar companies. Ask anyone, call anyone, go see it if you need to. The only thing keeping us away is a grandbaby arrival. These are the very best of the most visited resorts based on our current ratings. 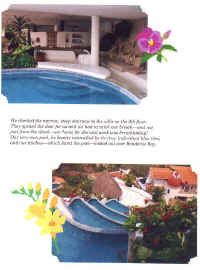 The resorts had to have a minimum rating input to qualify. All the below listed resorts have detailed reviews by our members in the "members only" section of this website. I don't know if it is actually possible to get an Ocho Cascadas week from other than Interval International or an owner. It will dramatically change your life. Our private estate for sale.